"Shattering Orthodox Unity: Motivations behind the Calendar Reform in the Orthodox Church"
On the eve and day of February 12 (Jan. 30 by the Old Calendar), the students and faculty of Holy Trinity Orthodox Seminary gathered for a hierarchical All-Night-Vigil and Divine Liturgy to commemorate the feast of the Three Hierarchs, St’s Basil the Great, Gregory the Theologian, and John Chrysostom. 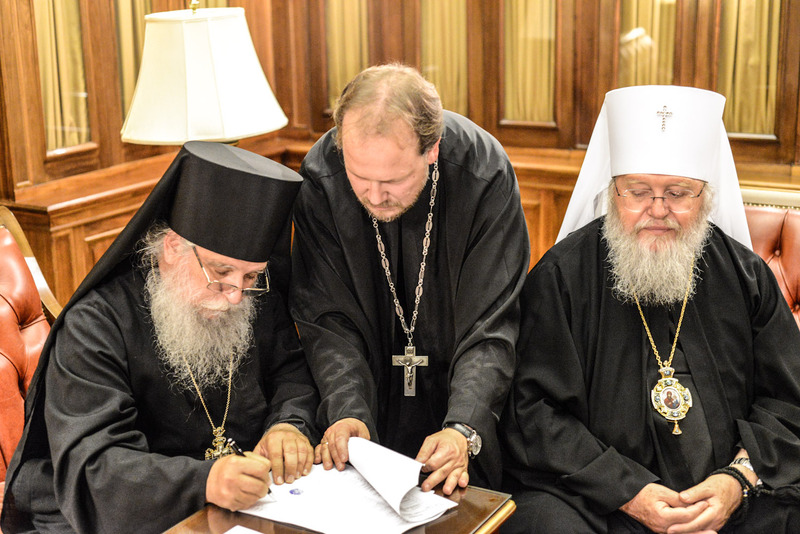 Metropolitan Hilarion, primate of the Russian Orthodox Church Outside Russia, officiated. On February 21, 2013, Archpriest David Straut, rector of St. Elizabeth the New Martyr parish in Rocky Hill, NJ, and chaplain of Somerset County Jail, came to HTS to speak to the seminarians about one of the more sensitive and poorly-understood topics of pastoral ministry. On the weekend of February 22–24, 2013, four students from Holy Trinity Orthodox Seminary attended the Spring General Assembly of the Orthodox Inter-Seminary Movement (OISM) hosted by Christ the Savior Seminary (Carpatho-Russian Diocese) in Mercer, Pennsylvania. OISM is composed of representatives of Orthodox seminaries in the United States who meet twice a year for inter-jurisdictional fellowship and pastoral education. The delegates from Jordanville this semester were third-year students John Martin and Srdjan Puskar and second-year students Stanislav Matveev and Stefan Stoyanov. John Martin and Srdjan Puskar also serve as this year’s OISM Secretary and Vice-President, respectively. On March 3, 2013, singers from Holy Trinity, St. Tikhon’s, and St. Vladimir’s Seminaries joined together for the first time to sing a concert under the direction of Vladimir Gorbik, the choir director at the Moscow Representation Church of the Holy Trinity St. Sergius Lavra. The concert commemorated the 75th anniversary of St. Tikhon’s and St. Vladimir’s, and well as the 65th anniversary of Holy Trinity Seminary. St. Jonah Orthodox Church, a parish of the Russian Church Outside of Russia, Diocese of Chicago and Mid-America, sponsored an exhibit of historic Russian icons and a Liturgical Choral Concert in the English language, March 1-3, 2013 in Spring, Texas. Guest speakers were the Archimandrite Luke (Murianka), Dean of Holy Trinity Seminary and Abbot of Holy Trinity Monastery, along with Dr. Kurt Sander, composer of Orthodox Liturgical Music and Associate Professor of Music Theory and Composition and Music Department Chair at Northern Kentucky University. 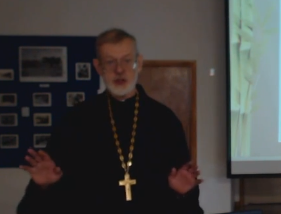 Father Yaroslav covers a range of sensitive topics concerning marriage and couples seeking marraige. 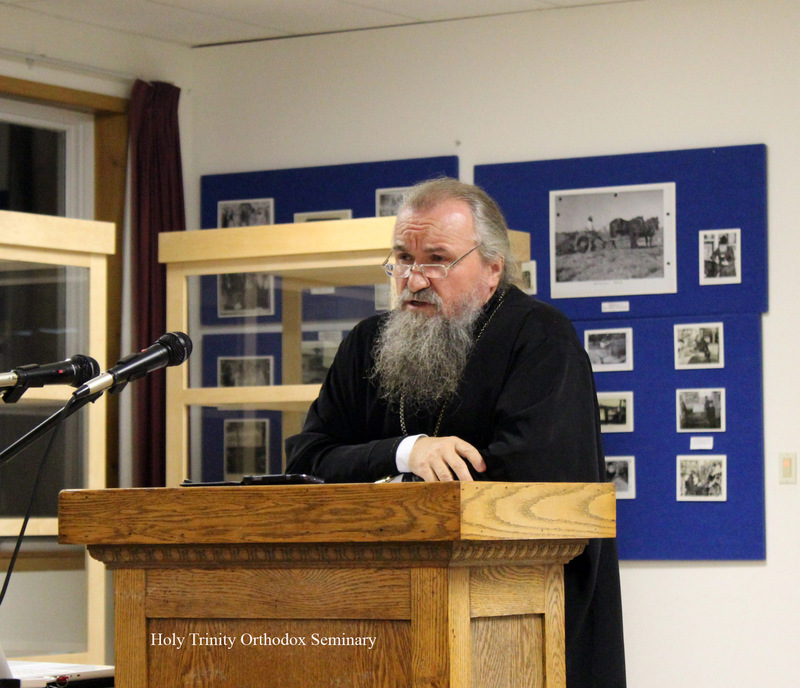 On Thursday, March 14, 2013, Holy Trinity Orthodox Seminary hosted a lecture on the concept of the person in Orthodox theology, presented by Alexis Torrance, D.Phil. (Oxon. ), a patristics scholar and the author of a recent monograph "Repentance in Late Antiquity: Eastern Asceticism and the Framing of Christian Life" (Oxford University Press, 2012), who currently is a Research Fellow at the University of Thessaloniki (Greece). On Saturday, March 16, on the feast of the Commemoration of all our God-bearing Fathers who shone forth in asceticism, the fifth anniversary of the repose of the ever-memorable Metropolitan Laurus -- fifth First Hierarch of the Russian Church Abroad -- was prayerfully commemorated at Holy Trinity Monastery in Jordanville, NY. On Monday, March 24, His Grace Bishop Jerome of Manhattan met with instructors and students of Holy Trinity Orthodox Seminary in Jordanville. The meeting took place within the coursework of Canon Law, the subject that strongly demands guidance from an Orthodox bishop. The focal point of the Holy Trinity Seminary course “History of the Russian Church-326” is the study of the tragic events connected with the liturgical reforms of the seventeenth century and the subsequent split. 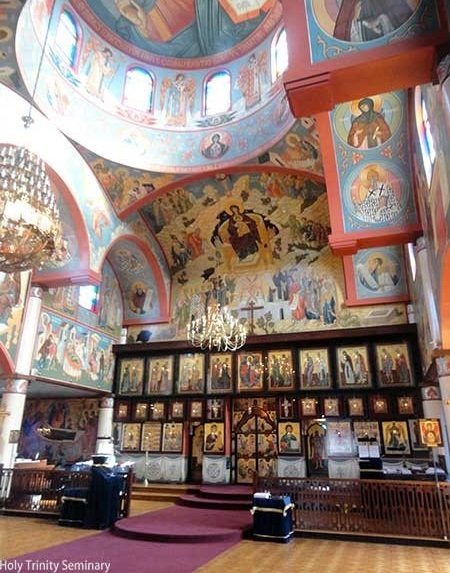 Therefore, it has almost become a tradition to visit the Nativity of Christ parish, a former Priestless Old-Believer parish which was received into the Russian Orthodox Church Outside Russia in 1983. The parish is located in Erie, PA, and services are performed according to pre-Nikonian liturgical regulations. From April 1–3, the Eastern American Diocese sponsored a Northern Lenten Retreat at Holy Trinity Monastery. 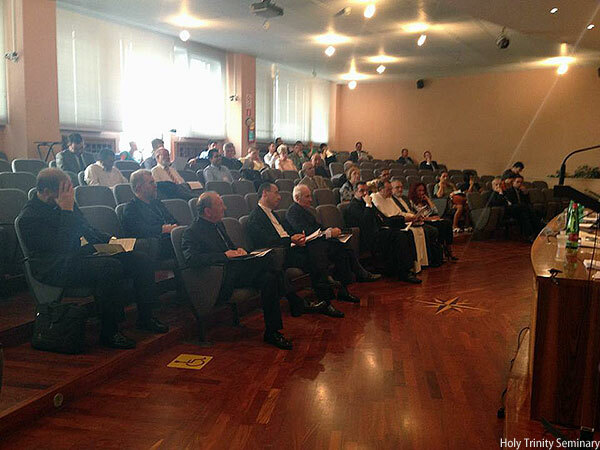 Clergy from both the diocese and the Moscow Patriarchate parishes participated in the retreat. His Eminence Metropolitan Hilarion (HTS 1972) and His Grace Bishop George of Mayfield (HTS 1980) came for the conference, and there were over eighty attendees. On Sunday, May 26, 2013, Holy Trinity Orthodox Seminary celebrated its 65th annual commencement. Candidates who had successfully completed all requirements were awarded Diplomas of the Bachelor of Theology Degree and the right to wear the seminary ”znachok,” or badge. These together signify the culmination of years of successful study, examinations, participation in Holy Trinity Monastery’s Divine Services, and labor at monastery obediences. The Society for the Study of Canon Law of the Eastern Churches was established at the University of Vienna in 1971. It is a purely academic and non-ecclesiastical body that aims to gather into one place the academic research of those Catholics who have a special sui juris (non-Western) Canon law focus and the Eastern Orthodox. There is currently no other comparable academic conference concerning canon law. The Congress is held every two years. 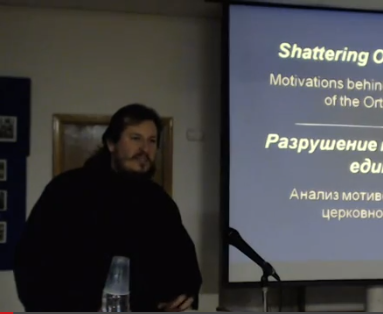 On September 13, 2013, Archimandrite Roman (Krassovsky), spoke to students and visitors about his role serving as the head of the Russian Ecclesiastical Mission in Jerusalem. Fr. Roman is a graduate of Holy Trinity Seminary (Class of 1984) and lived at Holy Trinity Monastery for 30 years as a hieromonk, conducting the monastery choir, and teaching classes in Liturgics, Church Music and Typikon at the seminary. On Tuesday, September 17, Nicholas Chapman, director of Holy Trinity Publications, interviewed priest John Strickland concerning his own work and HTP’s latest publication titled “The Making of Holy Russia: The Orthodox Church and Russian Nationalism before the Revolution” This book is a critical study of the interaction between Russian Church and society in the late nineteenth and early twentieth century. 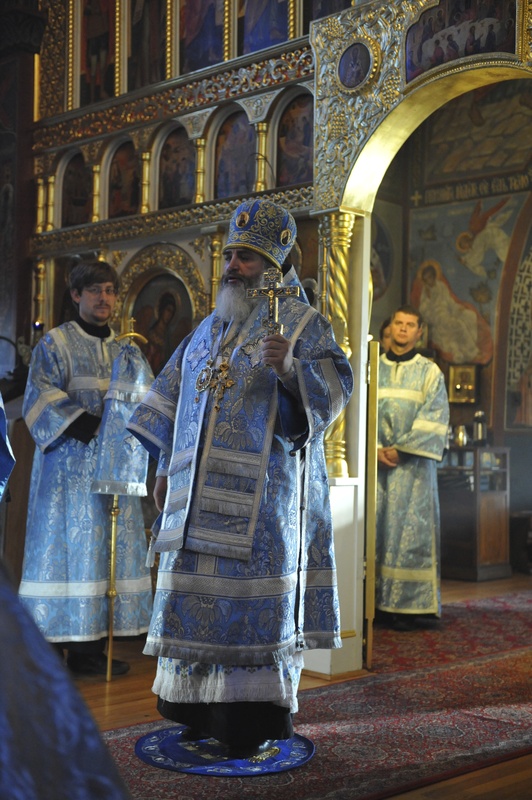 On September 24, 2013, His Grace, Bishop Mstislav of Tikhvin, Russia, visited Holy Trinity Monastery and Seminary as part of a tour of Orthodox Christian churches, monasteries and holy sites in the United States. At six o’clock that morning, a Hierarchal liturgy was served in the Holy Trinity Monastery Cathedral, in which students served in the the altar and sang in the choir. On October 15, Holy Trinity Seminary’s library was awarded a donation of books from the House of Russian emigre Alexander Solzhenitsyn which is part of the State Institution of Culture in Moscow. HTS was represented by His Eminence, Metropolitan Hilarion of Eastern America and New York, first Hierarch of the Russian Church Abroad, Rev. Archimandrite Luke (Murianka), the rector of Holy Trinity Seminary, and Rev. Archpriest Vladimir Tsurikov, director and curator of the Russian History Foundation as well as HTS trustee. All three are graduates of HTS. Fr. Luke officially signed the papers for the donation of the books at the Russian Consulate in New York City. Rev. Father John Bartholomew, on a visit to Holy Trinity Monastery and Seminary, spoke with the students concerning his research in preparation to publish a new book on St. Nicholas of Japan. Having converted to Orthodoxy while in Japan, Fr. John later studied at St. Vladimir’s Seminary and wrote a thesis on St. Nicholas. Announcements are to highlight upcoming events or information items which are not news. On the evening of November 7, 2013, V. Rev. Nikolai Kolyada, from Vitebsk, Belarus spoke to the Holy Trinity Orthodox Seminary students about temperance (alcohol abstinence). On Monday December 2 at 5 PM in the Seminary Hall, author, professor, and еntrepreneur Alexis Sukharev met with the students of Holy Trinity Orthodox Seminary to speak about his book “Life and Death of Priest Ilya Popov”. 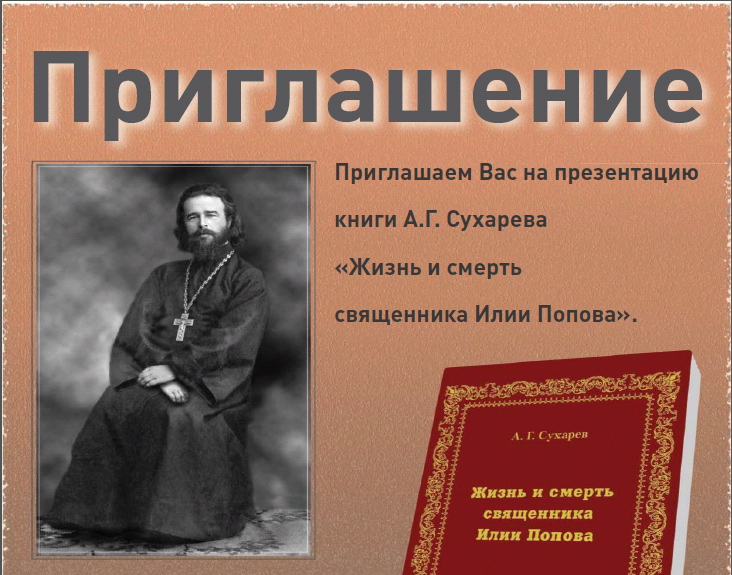 The book was published in Russia in 2013 with the blessing of The Most Rev. Mercury, Metropolitan of Rostov and Novocherkassk. On December 9 (Nov. 26 OS), Holy Trinity Monastery celebrated an All-Night-Vigil for the Kursk-Root Icon. On the following day, (Dec.10/Nov.27) the Divine Liturgy was followed by a pannykhida for all of the reposed Romanov family. At 1:00pm in the Holy Trinity Seminary hall there was a special presentation, including a lecture with PowerPoint presentation and a choir concert in honor of the Romanovs. Refreshments were provided. The fall 2013 exam session began on Monday, December 16, and will continue until Saturday, December 28. Bachelor of Theology and Certificate of Theological Studies students take exams together in the Seminary Hall. Four seminarains from HTOS traveled to Glen Cove, NY for the Eastern American Diocese's annual St. Herman's Conference, which began Sunday, Dec. 22 and will finish Thursday, Dec. 26. Artem Siss, Danill Semenov, Stefan Stoyanov, and Nicholas Williams took part. 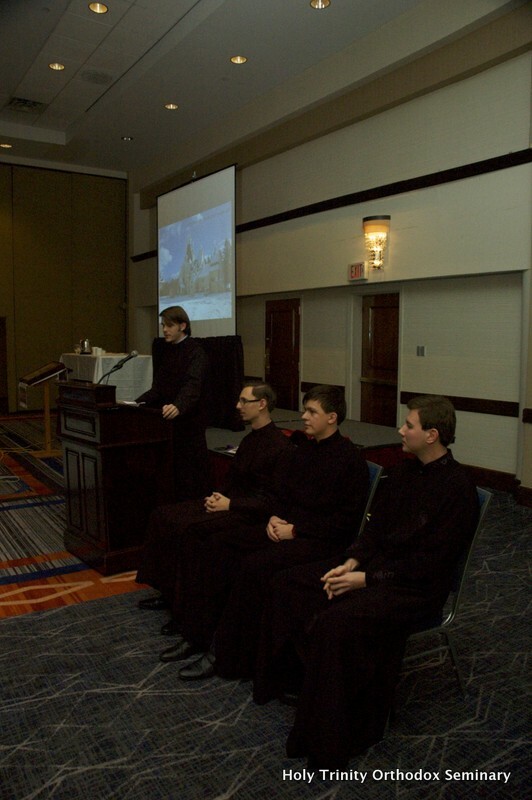 On December 23, 2013, four seminarians gave a presentation at the Saint Herman’s Youth Conference in Sea Cliff, New York. The Saint Herman’s Conference is a yearly conference which began at Holy Trinity Monastery, where Orthodox youth come together for a few days at the time of the Julian Calendar feast of St. Herman of Alaska, which falls on the Gregorian Dec. 25, in order to attend relevant lectures, enjoy the Divine Services together and meet other Orthodox youth. The presentation was attended by a large audience and included His Eminence, the Very Reverend Gabriel, Archbishop of Montreal and Canada.